It’s too weird to see many bands on our days trying to make old metal styles, but not putting something of their own into their music. Of course you can play an old style, and there’s nothing wrong with that. But you must put your identity on the thing you’re doing, you must breathe some life onto it. If not, your music will be like a Dolly clone of something. There aren’t two identical persons in the entire world, so, it’s impossible of someone plays or do other things totally equal to another one. And if something like that happens, one is the original, the other is a clone, a copy, a fake, and as this all, doesn’t has any value. A fine example of how to breathe new life in an eroded Metal style is the Finnish death metal quartet SEPULCHRAL CURSE. 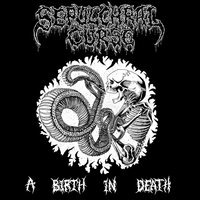 Their first work, the EP called “A Birth in Death”. In these four tracks, you won’t find anything new at all. No, here’s the purest traditional death metal in the same vein of DISMEMBER, ENTOMBED, DEICIDE and other names. But of course their personality is too strong, for the way they play tears apart any traces of mold or dust you could find. No, in their hands, Death Metal gained a new life, with extremely guttural grunts, very good guitar riffs, brutally heavy rhythmic kitchen. And if you hear with attention, you’ll find some traces from the so-called Finnish Metal under the brutal massacre they play. The sound quality is not the best we could find. But is good enough to understand what they are playing, and what they want to do with their music. Of course they could do something better, but the level we find here is good. Of course the four songs of the EP are very good, indeed, but one of them is really especial, “Infernal Pyres”, where they use some astonishing slower tempos, but they change the paces a lot on it, with very good guitar riffs, some solos with good melodies and vocals. But it seems to me that they really can do better than we can hear in this EP, so I am anxious for their future works!